Arvind's World: UID - An armchair hype or a panacea ? We have multiple identity cards when it comes to proving our identity – PAN number, EPIC (Electoral Photo Identity Card) number, Ration Card number, Passport number and so on. It implies that those of us who have, we have it in plenty. Other countries such as USA has Social Security Number (SSN) which acts as a single convergence point when it comes to proving one’s identity anywhere in US, be it shopping malls, filing IT returns, driving license, Employment or any where requiring an identity. It makes things easy, both for the individual as well the authorities. But till date, there remains no nationally accepted, verified identity number that both residents and agencies can use with ease and confidence in India. As a result, every time an individual tries to access a benefit or service, he/she must undergo a full cycle of identity verification. Different service providers also often have different requirements in the documents they demand, the forms that require filling out, and the information they collect on the individual. Such duplication of effort and ‘identity silos’ increase overall costs of identification and cause extreme inconvenience to the individual. This approach is especially unfair to India’s poor and underprivileged residents, who usually lack documentation, and find it difficult to meet the costs of multiple verification processes. As a result, there are at least two third of the individuals and at least one third of the families who do not have ( or don’t have the correct proof) a single form of identity proof, be it ration card, driving license or EPIC card and this is a huge number of identity less, faceless Indians! Absence of a clear identity number deprives them of availing various social welfare programs by making them ineligible from such benefits due to their lack of identification. There are clearly, immense benefits from a mechanism that uniquely identifies a person, and ensures instant identity verification. The need to prove identity only once will bring down transaction costs for the poor. More importantly, it would enable them to avail benefits of various schemes of the Government which are other linked with proof of identity. It would also enable the government to shift from indirect to direct benefits, and help verify whether the intended beneficiaries actually receive funds/subsidies. A single, universal identity number will also be transformational in eliminating fraud and duplicate identities, since individuals will no longer be able to represent themselves differently to different agencies. This will result in significant savings to the state exchequer. Examples include benefits of de-duplication while availing LPG gas cylinders or bogus/duplicate ration cards. The Government of India undertook an effort to provide a clear identity to residents first in 1993, with the issue of Electronic Photo Identity cards (EPIC) by the Election Commission. I did massive work to maximize coverage under EPIC while working as Joint Collector, East Godavari District during 1995-96 but despite best of intentions and efforts, the scheme didn’t take off at the country level. Subsequently in 2003, the Indian Government approved the Multipurpose National Identity Card (MNIC). It was felt that a single identification number at a national level would be essential to make a meaningful intervention. In 2007, the Planning Commission had recommended an approach to issuing unique identification numbers, where the enrolment into a Unique Identification (UID) database could be speeded up by using existing resident records in the databases of the Election Commission, PAN etc. This approach would speed up enrolment for those residents present in one of the aforementioned databases. The Unique Identification Authority of India (UIDAI) was established in February 2009, and is attached to the Planning Commission. The purpose of the UIDAI is to issue a unique identification number (UID) to all Indian residents that is (a) robust enough to eliminate duplicate and fake identities, and (b) can be verified and authenticated in an easy, cost-effective way. The UIDAI’s approach will keep in mind the learnings from the government’s previous efforts at issuing identity. UIDAI came like a whiff of fresh air on horizon otherwise marred by the attitude of cynicism to a typical bureaucratic set up. It was further hyped by the presence of Mr Nandan Nilekani as the head of UIDAI leading to lot of excitement and expectation among the public and a general sense of belief that UID number shall take care of lots of issues and problems. It is in this regard I feel that there are lots of misconceptions regarding what UID can do (and what it can’t). Based on my interaction with UIDAI officials and literature, I feel it necessary to demystify some of these misconceptions. What is UIDAI & Unique Identification Number? The basic advantage of the UID is that the UID will be one number, which can be used to prove identity for life. Once the resident gets the unique ID, it may be accepted as identity proof across service providers. The UIDAI, as a statutory body, will be responsible for creating, administrating and enforcing policy. The Authority will prescribe guidelines on the biometric technology, the various processes around enrolment, and KYR (know Your Residents) verification. The UIDAI will also design and create the institutional microstructure to effectively implement the policy. This will include a Central ID Data Repository (CIDR), which is a Central data repository. 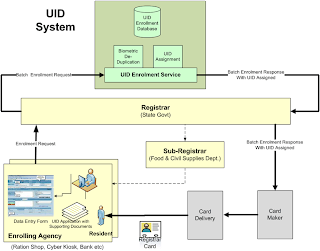 It will implement the core services around the UID – it will store resident records, issue unique identification numbers, and verify, authenticate and amend resident data. The CIDR will only hold the minimum information required to identify the resident and ensure no duplicates. UIDAI will partner with ‘Registrars’- The Authority will partner with Central and State Governments and their agencies, Government & Semi-Government and private Institutions such as Banks, Insurance companies (LIC,GIC etc) who will be ‘Registrars’ for the UIDAI. To give an illustration, UIDAI will like to partner with State Governments for issuing UID numbers to all Ration Cards in the State. Registrars will process UID applications, and connect to the CIDR to de-duplicate resident information and receive UID numbers. These Registrars can either be enrollers, or will appoint agencies as enrollers, who will interface with people seeking UID numbers. The Authority will also partner with service providers for authentication. The UIDAI may seek the following demographic and biometric information in order to issue a UID number: Name, Date & place of birth, Gender, Father’s & mother’s name, Address (Permanent and Present), Photograph & bio-metric feature such as Finger prints. These details will be required to be maintained in the unique database for each individual in CIDR and would enable it run a de-duplication process while issuing UID. UIDAI, by involving as many Registrars as possible hopes that every individual ultimately will get covered by at least one of such Registrars. Process - The enrolment process for the UID number will begin with the Registrar will undertake an exercise to compile a database on individuals/ families based on the criteria given by UIDAI. A resident will submit his/her information to the enrolling agency of the Registrar with supporting documents. This information will be verified according to established Know Your Resident (KYR) standards. Once the enroller verifies the resident’s information, it will submit the application request – either singly or in batches – through the Registrar to the CIDR. To illustrate, take the case of Ration Cards database. All the States (Registrars) already have an existing database on ration cards. However, if these are to be issued UID numbers, the existing database is not enough and will have to be upgraded by incorporating additional requirements of UID such as bio-metric features of the individuals and their photographs. It implies that the State Government (Registrar) will have to undertake an exercise afresh to collect such information and compile the same. Once it is ready, it will then send the same to UIDAI’s CIDR. The CIDR will then run a de-duplication check, comparing the resident’s biometric and demographic information to the records in the database to ensure that the resident is not already enrolled. It will then generate and issue a UID number for each of such applicants and sends these numbers back to the Registrar who in turn incorporates these numbers in the documents such as Ration Cards and issue them back to the applicant. It has to be kept in mind that the UID number will only provide identity and will in no way guarantee any rights, benefits or entitlements. Further, the UIDAI will only issue a number based on the database furnished by the registrars and UIDAI will not issue any UID card. The number issued by UIDAI may be printed on the document/card that is issued by the Registrar. It is important to note that the UID number will be an un-intelligent number i.e. the number generated by UIDAI as UID will not contain intelligence. It will be a random number in a manner that sequencing of numbers has no bearing on any trait of the individual such as location, caste, gender, employment status etc. UIDAI feels that loading intelligence into identity numbers makes them susceptible to fraud and theft. It is also to be noted that the UID will prove identity, not citizenship which means that all residents, including migrants from neighboring countries such as Bangladesh can be issued a unique ID. The UID is proof of identity and does not confer citizenship. What is crucial is Enrolment for UID is voluntary and not mandated. The UIDAI approach is demand-driven. This will not however, preclude governments or Registrars from mandating enrolment. As we have seen by now, UIDAI will not collect data. It is the Registrar who, if interested, will collect data based on the guidelines and requirements of UIDAI. Moreover, the UID is optional. What these two issues when put together imply is that individuals, who are left out of the purview of schemes of Government presently mainly because they don’t have access to or necessary documents will continue to be left out under UID coverage also. Let me give an example. UIDAI, while aiming for a synergic partnership with PDS (Public Distribution System) through State Governments as Registrars, boasts of ‘detection of duplicate and ghost cards’ through its de-duplication process, as its USP. However, I wish to point out that among the category of ‘ineligible ration cards’, the category classified as ‘duplicate’ (individuals/ families having more than one card) will not account for more than 10-15%. Most of the ineligible cards are on account of ‘exclusion’ (those eligible but left out) and ‘inclusion’ (those ineligible but having ration cards) errors. And the problem will continue to exist even after all have been issued UID. The ultimate decision to (i) ensure 100% coverage of population for the purpose of PDS and (ii) classify them under BPL category or otherwise remains with the Registrar and UID being just a number will not going to take care of 85% of the ineligible cards. It is in this sense that I fear that poor, marginalized, destitute, homeless and migrant laborers will be left out of the purview of UID. As such, UID may end up yet another complex multi digited number as identity proof for those who already have so many and the real needy ones will continue to be left out. MNIC (Multipurpose National Identity Card) under National Population Register (NPR) - After the Kargil war, the Subramanyam Committee recommended that all citizens be issued identity cards. A pilot project was launched for issuing multi-purpose national identity cards (MNICs). NPR will go on simultaneously with the Census 2011 and it will capture 15 features of the individuals including bio-metric details and a photographs. All this will be made available in a 64 kpbs chip on the MNIC card. It is important to note that all the people residing in the country (‘usual residents’) will be enumerated under NPR and that way, it is certainly a far superior method when compared with UID which is optional and is totally dependent upon registrars to provide details of the individuals. The data collected under NPR will be given to UID for the purpose of generating UID and that way, RGI (Registrar General of India) will be one of the Registrars for UIDAI. I feel strongly that MNIC is a better option and will cover all marginalized, homeless, destitute and all other categories that are being left out under the UIDAI. That way, UIDAI is just hype and is becoming a platform for instant publicity of few, who unfortunately are realizing the ensuring 100% coverage involves much more that rhetoric and media interactions. Ultimately, as it turns out, UID is nothing but an un-intelligent number plastered on MNIC or PDS ration card and that way, doesn’t deserve the kind of hype it has been associated with or those working for it. Prime Minister Manmohan Singh and Congress president Sonia Gandhi attended the inaugural function of Aadhar/ Unique Identity (UID) project in Maharashtra's Nandurbar district on Spetember 29, 2010. It was from Nandurbar that Sonia Gandhi held her first political rally in 1998. According to the government's decision, each person from the BPL category will get Rs. 100 as an incentive for enrolling to the scheme. I am not sure though how it will solve the challenge of 100% coverage. The issue of who identifies BPL families remains with the State Governments and the ills that plague the system will continue to haunt it in future too. Interesting take on UID hype....I always thought we are going mad on UID without realising that a massive exercise for NPR is already underway in this country. Cheers...boss.